The 40-odd employees of the Hicksville Public Library who belong to the Civil Service Employees Association (CSEA) have been working without a contract since the collective bargaining agreement expired on June 30, 2011. Protracted negotiations have failed to produce an accord, and on May 20, the library’s Board of Trustees filed a formal Improper Practice Charge with the state’s Public Employment Relations Board (PERB) against the CSEA Local 100, charging it with failing to negotiate in good faith. 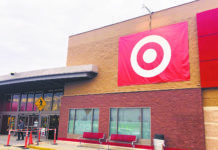 During the board’s July 20 meeting, when asked about the status of the negotiations, the board’s counsel, Tom Wassel, said that both parties were subject to a news blackout. Employee Richard Vizza, on a break from his circulation desk clerk job, handed out a copy of the opinion piece written by JPMorgan Chase CEO Jamie Dimon for The New York Times. In it, Dimon explains why his company was upping the minimum wage for its lowest paid employees. “A pay increase is the right thing to do. Wages for many Americans have gone nowhere for too long. Many employees who will receive this increase work as bank tellers and customer service representatives. Above all, it enables more people to begin to share in the rewards of economic growth,” Dimon wrote. 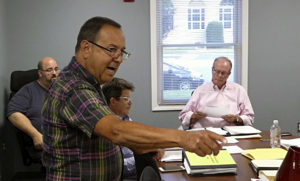 Hicksville Public Library employee Richard Vizza makes a point during the July meeting of the Board of Trustees. Vizza had distributed a copy of an opinion piece by JP Morgan CEO Jamie Dimon stating that the corporation would be raising the wages of its lowest paid employees. Listening, from left, are Joe Gangemella of the maintenance department, and trustees Carlos Munozospina and Bert Cunningham. 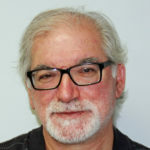 Vizza told the Hicksville News that though he was bound by the terms of the news blackout, his message was clear: the library’s employees deserved a raise. It also noted that on July 21 a full six months will have passed since the CSEA vote on Jan. 21. The next regular meeting will be held on Wednesday, Aug. 19 at 7 p.m. in the Administration Building, 120 Second St. There was an error in an article in the Aug. 10-16 issue of the Hicksville News regarding a Hicksville Public Library Board of Trustees meeting on July 20. It quoted minutes from a July 20, 2015 board meeting as if they were taken at the July 20, 2016 meeting that the News covered. 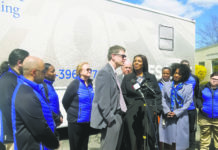 It thus gave the mistaken impression that the trustees had violated the news blackout agreed to with the CSEA, the union representing the library’s employees, on the status of the contract negotiations. The employees have been without a contract since June 30, 2011. The board did not, in fact, ignore the blackout agreement.